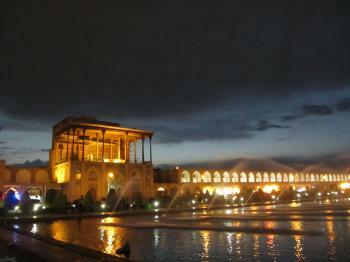 Meidan Emam, Esfahan is one of the largest city squares in the world. The square is surrounded by important historical buildings from the Safavid era. The Shah Mosque is situated on the south side of this square. On the west side you can find Ali Qapu Palace. Sheikh Lotf Allah Mosque is situated on the eastern side of this square and the northern side opens into the Isfahan Grand Bazaar. The fact that the Meidan Emam was inscribed so early in the life of World Heritage is hardly a surprise; this square is the darling of the Iranian tourism industry, and rightly so. An interesting point to consider is this timing of the submission and acceptance of this site to the World Heritage List; the 1979 World Heritage Convention occurred in May, only a few months after the Islamic Revolution. The reference in the ICOMOS evaluation of 1979, and the other 1979 documents available on the UNESCO website, makes reference to the ‘Meidan-e Shah’, and the ‘Shah Mosque’, without any mention of the renaming of these components by the new regime. I guess the new Islamic Republic valued the prestige of the nomination enough to still accept it, though evidently with a name change, as the 1988 report makes no mention of the deposed shah. I am unsure of the precise nature of this process of naming; probably an unreported element of the 1979 convention? The square, apart from the open space itself, has three main components. The obvious first stop is the Ali Qapu Palace, renowned more for its view of the square than for its own sake. This is unsurprising; while the palace has some nice ornamentation, especially on the top floor, the view is the real star here. 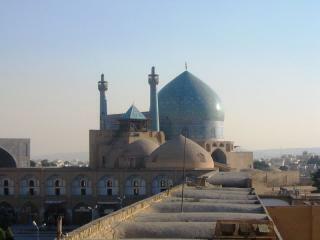 The Emam Mosque, still often called the Shah Mosque, is the most striking component of the square, with its large façade and towering dome. I arrived at opening time to have it to myself. Within 15 minutes, however, 6 separate tour groups were competing for space. Unlike the Masjid-e Jame, this was a significant concern, as immense restoration works are currently underway. Overhearing an English-speaking guide, retiling work started a week prior to my visit (10 April 2016). The result of this was the covering of about 90% of the central courtyard of the mosque with a low tarpaulin ceiling, with about 20% of that remaining space being covered during my presence by ongoing work. This meant that all visitors were crowded beneath this section, trying to get a view of the dome. Within a couple of days, I expect this to be completely covered, which I imagine would severely impact the enjoyability of the site. By the scale of the tile restoration, I assume covering will exist for quite some time. The square itself is worth seeing at all times of the day, with the Palace particularly impressive while illuminated after dark. This square is the most beautiful palce in the world and believe me you can not compare sitting there for a break to doing it at any other- european or else place. 'Threatened' by Tunnels: "State of conservation report raised concerns about the Metro now well under construction parts due to open in 2012) whc.unesco.org/en/soc/252 The 2012 WHC decided as follows "... requests the State Party to invite a joint World Heritage Centre/ICOMOS reactive monitoring mission to the property to consider the impact of the current metro constructions on the property and its wider setting;"